From our end of the lake we headed straight for the south side. To hear about our first stop, check this post out. The north end, where we were staying, was devoid of most human life which made it quite and peaceful. I would have guessed that the whole lake would be like this. I felt like I had just drove into New York city (minus all the trees). The south end of the lake has a very different feel from the north end. There were cars every where. People up and down the sidewalks. It was a bustling city. I wanted to come to this end of the lake for pretty much one reason. What I would consider the biggest attraction on this end of the lake. Heavenly. No I’m not an angel, no one had to die to visit Heavenly. What is it then? Heavenly is a large ski hill. Yes, the biggest pull of Lake Tahoe is all of its ski hills. But this one has a gondola you ride to get to the top of the hill. Why go in the summer? Because of the village at “ground level”. There are some sweet shops and fun stuff to check out. 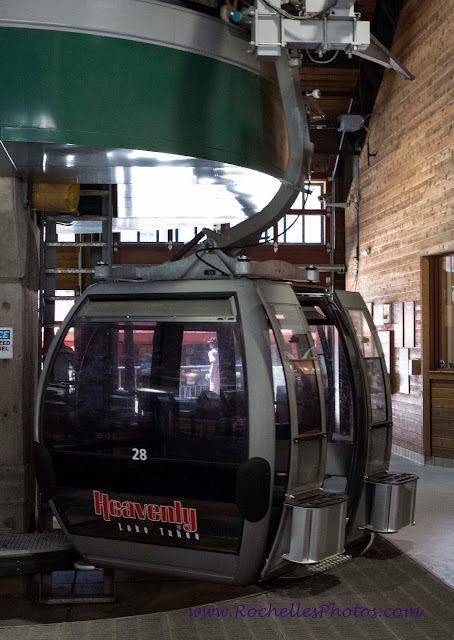 Have you ridden a gondola to get to the top of a ski hill? If you haven’t you should give it a try sometime. In the winter when you have your skis and poles, all you think about is there’s no time to load all of this on. How am I supposed to get the skis and poles in that tiny plastic compartment and step into the glass can, all while its still moving. Then there’s other people around trying to do the exact same as you. How do we do this without knocking each other over?..... That’s exactly what went through my head the first time I rode on a ski lift gondola. Summer time is different, there’s no skis or poles, no heavy clothing. The gondola is the same, you just aren’t. Would you like a little piece of heaven for your home. Now you can own a piece of Heavenly. Pick your print size here.